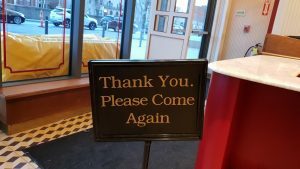 Beacon Street is a gem when it comes to all things food, from Japanese grills to Mexican taquerias. However, nothing appeals to the modern college student more than a good cafe, and what better place than South Campus’ Middle Eastern Cafe Landwer! The Israeli-based cafe opened its Boston location at 900 Beacon St. on Jan. 18 of last year. This week, I tried it out. We’ll be going over the good, the bad and the ugly of Cafe Landwer. At the end, we’ll come to a verdict on whether or not it’s worth the hype. First off, the place itself. The whole place is designed to look like a 1960s American diner, which I am an absolute sucker for. Everything from the fans to the floor was designed to fit together — the tables, the chairs, the lights — it all worked. I was pleasantly surprised that the place had servers who were all super friendly, which made the place actually feel a bit more casual than your average cafe. Board games were available to patrons, which just added to the already lively atmosphere. My one complaint: the playlist. No one wants to listen to Nickelback on a Sunday morning coffee break. No one. On to the food! 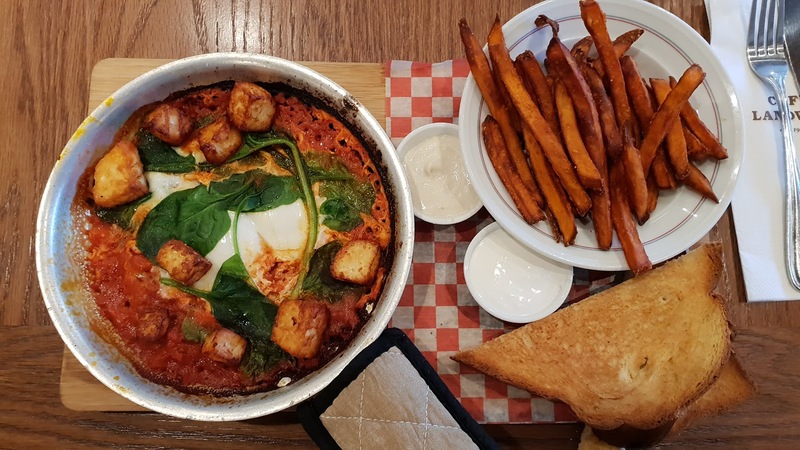 I ordered the Halloumi Shakshuka — one of four shakshuka options the eatery offers — and sweet potato fries, which were both served pretty quickly. The fries were pretty good, but nothing to write home about. The shakshuka was divine, once you waited for it to cool down. You could literally taste the individual ingredients as you chewed, from the salty tomatoes to the caramelized onions to the poached eggs. Everything fit together wonderfully. That is, except the halloumi. The cheese was definitely a weird addition, as halloumi is very rubbery and the least melty cheese of them all. It just tasted and looked like it was tossed on top of the shakshuka last minute. Lucky for me, they have three other kinds of shakshuka that don’t have the add-on. I know a good coffee when I taste one, and Landwer makes a good coffee. They took some time to serve it, arriving after the shakshuka and fries, but perfection takes time. The house blend was served at the perfect temperature, not tongue-burning hot, but still hot. It was smooth and rich and flavorful and had no aftertaste or acidity. I’m not saying it was good enough to ask for the blend to take home, but that’s exactly what I’m saying. I’ve had Cafe Landwer’s rosalach before. I am 100 percent for trying new things, especially when it comes to food, and even though the waitress recommended five different deserts, I couldn’t not pick the rosalach. That’s how good it is. 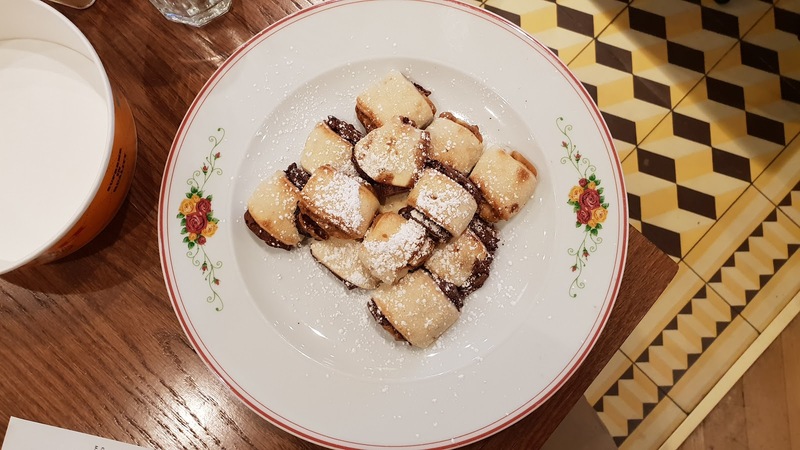 Cafe Landwer’s menu calls this desert “crispy stone oven dough baked with chocolate hazelnut cream or cookie butter spread,” but I would call it heaven. Ignore the rest of this post if you must, but know that Cafe Landwer’s rosalach is the best thing in Boston. Mark my words. As for the bane of all students: the price. I am happy to announce… surprisingly affordable! 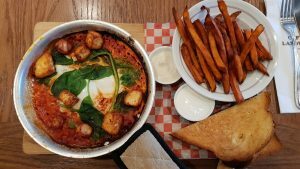 The Halloumi Shakshuka cost $13, just a tad more expensive than the honestly-much-better-Tatte-Shakshuka. The fries and coffee were totally worth it at $3 each, and the rosalach could cost $100 and still be worth it, but lucky for us, it’s $12 for 13 pieces. So, is Cafe Landwer as good as its rep?